Search is the main way customers find your products on Amazon. When customers search by entering any words, Amazon matches it against product information including title, key features, description and search terms. In the last few months, I have been looking at the impact of Amazon search terms on organic search and sponsored search result. Search terms are hidden keywords for your product and additional opportunity to ranking your products additional keywords. You can find additional information on Amazon page. In my experiment, I have used search term “bob Marley coffee” for ASIN (A) as highlighted below. I did not find any impact of this word on organic search as shown on search result below. In order to find if my “search term keyword” has indexed my product, I entered ASIN (A) + “bob Marley coffee”. If my product was indexed I would not see “0 product found.” There also a tool, “sellics index checker” to help you find exactly the same. So, on this instance competitor brand search term (bob Marley coffee), did not index my product on organic search. 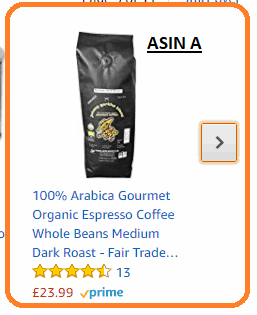 Interestingly, I found out that this search term (bob Marley coffee) has helped ASIN ( A) to appear on Amazon Sponsored Automated Ads on competing for product detail page, as seen on the screenshot below within orange box. This is encouraging! It looks like when we run Amazon Automated ads, the system reads through full content including search terms and considers competitor keywords (bob Marley coffee) as relevant search terms to display your products.